With endless amenities and a multitude of exotic destinations, a luxury yacht charter guarantees a vacation like no other. Forget dealing with hotel hassles, check-in times, and room mix-ups; a luxury yacht charter allows you to enjoy a hassle-free vacation. 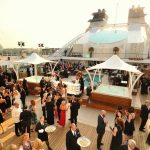 Luxury yacht charters offers many unique benefits including fully-equipped staff to anticipate your every need, cuisine catered exactly to your liking, and unparalleled luxury. With elegant finishes and luxurious interiors, a luxury yacht charter gives you the ability to enjoy five-star service all within the privacy of your own yacht. Whether you’re planning a family getaway or a romantic vacation, a luxury yacht charter offers both versatility and indulgence. Yachts of all sizes can be chartered and are fully customizable depending on your needs and preferences. Due to the increasing demand for yacht charters in recent years, “bareboat” charters have become very popular, especially for those who have a bit more experience with sailing. While bareboat charters are not equipped with staff or crew, they offer a relatively inexpensive way to enjoy all of the luxuries of sailing and allow you to take control of your vacation. With you as the skipper, imagine the thrill of sailing in the azure waters of the Caribbean or venturing along the Mediterranean coast. If you’re looking for the ultimate vacation experience, a fully-crewed luxury yacht charter is the way to go. Having a fully-crewed luxury yacht charter takes the agony out of planning your vacation, as your staff will attend to your every need. In addition to a full crew, luxury yacht charters have a host of amenities in which you can indulge. You can enjoy culinary delights with your very own personal chef, dance the night away with an on-staff DJ, and enjoy courteous service from attentive bartenders and servers. For those seeking adventure, luxury yachts can be equipped with Jet Skis, scuba gear, kayaks, and more. You can sail to exotic destinations and enjoy thrilling watersports, or simply relax and bask in the tropical paradise as your crew provides personalized service. With a fully-equipped luxury yacht charter, the options are endless. If you plan on doing some sight-seeing or exploring while on your vacation, transportation services can also be arranged. Helicopter and limousine services allow you to travel in style while you hit up the local cities during your trip. When planning your next trip, ENB Yachts’ team of experts will match you up with a luxury yacht charter suitable for any budget, ensuring your next vacation is one to remember.